Oliver here. Today’s letter is “M” and that stands for “Mewsic”. Our Male Human is very mewsical and quite the guitar player. Alberto and I like to make mewsic with him and really like it when he changes the strings (we have loads of fun with that). We also love stealing his guitar picks and leaving them all over the house. Friday is becoming one of our favorite days with The Tribe of Five and there is always some quibbling about who gets to opine. I’m the lucky winner this week. 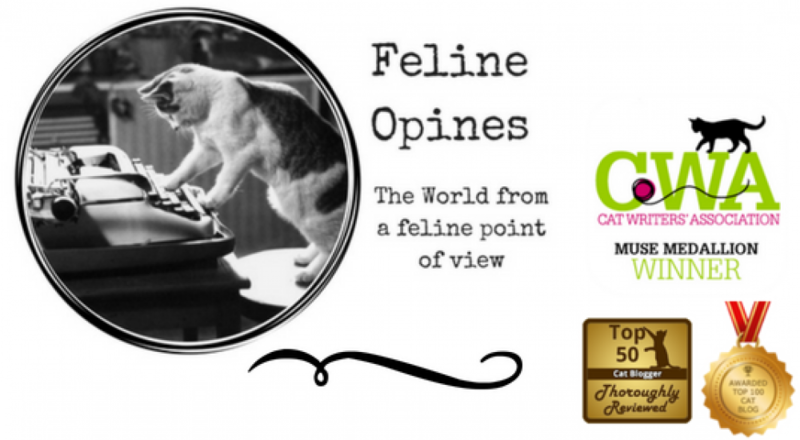 I hope you enjoy my responses and, as always, I encourage my fellow bloggers to join the blog hop with our friends, 15andmeowing or McGuffy’s Reader. And of course, you’re always welcome to do the fill ins in the comments on our blog. ‘Hope you enjoy my mewsical mewsings this week. 1. I have never been able to _____________________. 2. I wish I could still ___________________. 3. ____ is my ideal winter night. 1. I have never been able to understand why the male human insists on changing his guitar strings upstairs and not in his music room. What’s a cat to do when those tantalizing strings bounce back and forth in front of me? This is a form of feline torture. 2. I wish I could still sneak into the the male human’s music room but he has figured out a way to lock the doors so I can’t get in. And alas, all my sad expressions do not convince him to let me in. 3. Strumming a few tunes with my human is my ideal winter night. 4.Oliver and I are quite the mewsicians!